Most important things and you must add this to your website/blog to boost traffic. 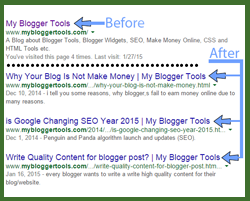 Your website homepage title is showing search results appears before every single post you are publishing to blogger platform. And Google search display correct characters in our search. And important keywords of the post titles to get apparel good results. I also attach some screen shot below would be very helpful to you. Lets See How To Make Blog Title After Post Title.? 4: After replace this code, you are successfully Done! this job. How To Make Money Online ...:::: Earn Methods ::::... Open your blog/website in search and see changes, and find is the blog title appearing after blog post title? If you have any concern about this post, you contact us, simply drop your message below "message area", if you like the above post simply share this post to your friend.